Cliff has come up with a complete and thorough system for creating presentations using PowerPoint Since I’ve defined presentations as having three parts, I’ll discuss his book in those categories. Content: You organize your content in a story-like format, using various theories and concepts that have been shown to be effective for persuasive, engaging communication. You create acts, like in a play, that integrate the audience into the story. You can download a template that provides this structure for you from Cliff’s Web site at www.sociablemedia.com. You place simple sentences in the title placeholder of each slide and that’s it. No bullet points, of course. You write what you are going to say in the Notes pane. Design: You add an image that relates to the text, whether literally or figuratively. That means no background template! You use the plain white background, although the image that you add can cover the entire slide. Each slide is different, although the artistic style should be similar throughout the presentation. Delivery: You never read from the slide; instead you use your notes from the Notes pane. For handouts, you always provide the Notes pages so people can see your text. Cliff provides some tips for the physical aspect of delivery, too, such as where to put your hands and how to stand. He explains how to create a dialog with the audience. There’s no question that using Cliff’s method will improve your presentations. You may not always want to do everything he says, but you will learn a lot by trying just one complete presentation using his method. See how it works for you. 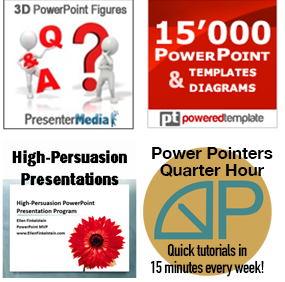 Beyond Bullet Points is directed towards business presentations that aim to persuade an audience. Cliff doesn’t talk about how his method could be used for information-heavy reports or for educational use. In these cases, the purpose is not to persuade or tell a story, but simply to disseminate information. In these cases, simply headings might not be enough. However, an educator recently told me that most PowerPoint presentations used in the classroom are terribly dull and that educators definitely need some techniques, too. Maybe some of Cliff’s techniques will move beyond the board room and into the classroom, even if in a somewhat changed form. When creating a slide to take audience ideas you can do it in slide show view by inserting a text box from the Developer tab. It works a treat. Dee, that sounds like the technique I describe here: http://www.ellenfinkelstein.com/pptblog/add-notes-during-a-presentation/. Cliff, I would like to “have a cup of coffee” with you over a virtual chat. I’ve created a piece of software that bolts on to PowerPoint that solves a lot of presentation problems. Born out of frustration having spent 20+ years in consulting. I’d love to get your opionion and give you the software to try out. Let me know if you want to connect virtually via GoToMeeting or something similar.